Reuters UKFrance's financial prosecutor is likely to take further legal steps this week in its investigation into allegations of fake work by presidential candidate Francois Fillon's wife, a newspaper reported on Sunday. Reuters UKThe Kremlin denied on Tuesday that it was behind media and internet attacks on the campaign of French presidential frontrunner Emmanuel Macron though his camp renewed the charges against Russian media and a hackers' group operating in Ukraine. Reuters UKFrancois Fillon faced down a rebellion by lawmakers in his centre-right party on Tuesday, but the revolt exposed a shaky confidence inside his camp as he tries to draw a line under a scandal that could derail his bid to win power. Reuters UKScandal-hit French presidential candidate Francois Fillon came under renewed attack from within his own conservative camp on Wednesday as he sought to hold his campaign together through talks with ex-president Nicolas Sarkozy. Reuters UKFrance said on Wednesday it would not accept interference by Russia or any other state in its presidential election, and would retaliate if necessary. France's financial prosecutor on Thursday said its investigations into fake work allegations surrounding presidential candidate Francois Fillon and his wife would continue. French presidential candidate Fillon tries to turn the page and talk policy. Reuters UKConservative presidential candidate Francois Fillon's woes piled up on Thursday when France's financial prosecutor chose to pursue a probe into the fake-work scandal that has dogged him, and as far-right rival Marine Le Pen gained in the polls. Marine Le Pen to get 27 percent in the first round of the French presidential election, Emmanuel Macron 20 percent, and Francois Fillon 20 percent, according to an Opinionway poll. Marine Le Pen, presidential candidate for France's far-right National Front party, cancelled a meeting on Tuesday with Lebanon's Grand Mufti after refusing to wear a headscarf for the encounter. "You can pass on my respects to the Grand Mufti, but I will not cover myself up," Le Pen told reporters. The press office for the Grand Mufti said that Le Pen's aides had been informed beforehand of their requirement for her to wear head covering for the meeting. 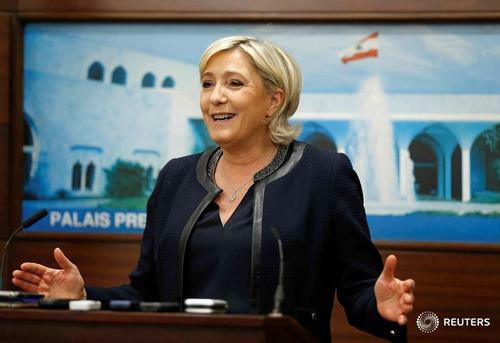 Le Pen has been visiting Lebanon as she seeks to bolster her presidential credentials. 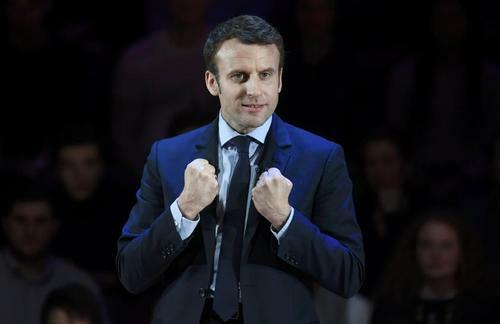 A senior Socialist minister said on Tuesday he might back centrist Emmanuel Macron in France's presidential election, a blow to his party's official candidate and a potential boost for Macron, who is battling to stay favorite in opinion polls. Reuters UKFrench presidential candidate Emmanuel Macron told British Prime Minister Theresa May on Tuesday not to expect any favours from the European Union during Brexit talks, and drew big cheers for his pro-EU message from French nationals in London. 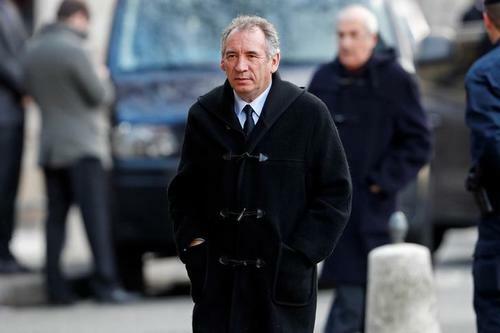 Reuters UKFrancois Bayrou, a failed centrist candidate in three past French presidential elections, was set to announce on Wednesday whether he will run or not in this year's tight race for the Elysee, a choice that could have an impact on the outcome. French judicial police are questioning far-right presidential candidate Marine Le Pen's bodyguard and chief of staff in relation to a probe into alleged misuse of European Union funds to pay parliamentary assistants, her lawyer said on Wednesday. Marcel Ceccaldi told Reuters that the affair was a "manipulation" aimed at destabilising the National Front's election campaign. Le Pen has previously denied any wrongdoing. 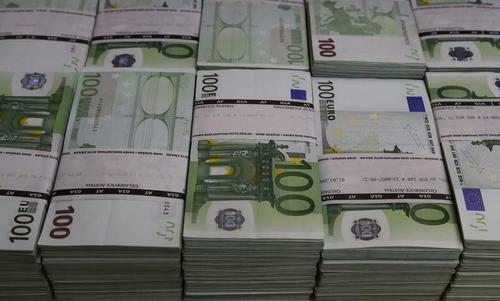 Reuters UKThe euro fell below $1.05 for the first time in six weeks on Wednesday, hit by a combination of concern over France's presidential election campaign and growing expectations for a rise in U.S. interest rates. 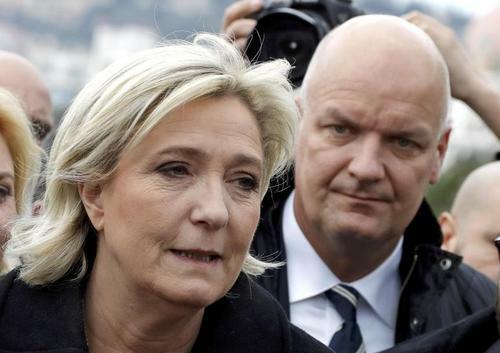 Reuters UKFrench police detained far-right presidential candidate Marine Le Pen's bodyguard and chief of staff in custody on Wednesday for questioning over alleged misuse of European Union funds to pay parliamentary assistants, Le Pen's lawyer said. French far right leader Marine Le Pen has increased her lead in the first round of France's presidential election, though she is still seen being beaten by a wide margin in the runoff, a BVA-Salesforce poll published on Thursday showed. ReutersFrench far-right-leader Marine Le Pen refused to attend a summons for questioning by police last Wednesday over allegations that she made illegal EU payments to her staff, her lawyer said on Friday. 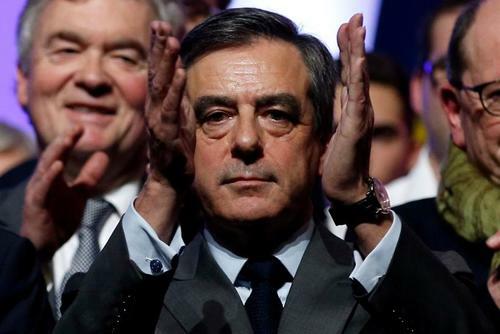 Reuters UKFrancois Fillon, The Republicans' presidential candidate, on Sunday accused the French government of not doing enough to curb the violence that has hit election campaign events. Reuters UKFrench independent candidate Emmanuel Macron would easily beat far-right leader Marine Le Pen in the second round of the country's presidential election in May, two opinion polls showed on Sunday. Reuters UKThere is much agitation in French political circles over struggling presidential candidate Francois Fillon's decision just announced to postpone a planned visit to the annual Paris agricultural fair today. Opinion pollsters have begun collecting voting intentions more regularly since the start of the year, with some now publishing a survey every weekday. Click on the link to view the trends they are picking up and the outcomes they foresee. ReutersGlobal investors trimmed their equities exposure in February, with many arguing that markets had become too complacent about risks stemming from Europe's election calendar after a recent blistering stock market rally. French government bond yields fell on Wednesday, tightening the gap with top-rated German peers after a report that conservative presidential candidate Francois Fillon has been summoned by the magistrates investigating a case involving payments to his wife. According to the Journal du Dimanche newspaper, the request by the magistrates, appointed last week to look at allegations she did little work for the money, was behind Fillon's announcement earlier on Wednesday that he was postponing a scheduled visit to the Paris farm fair. Fillon's team said in a statement that he would make a declaration at noon French time (1100 GMT). France's 10-year bond yield dipped to the day's low of 0.89 percent, paring earlier rises and narrowing the gap over German equivalents to around 66 basis points from about 68 bps on Tuesday. 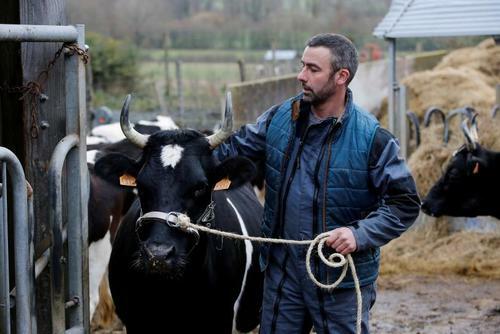 Reuters UKFrance's presidential pretenders will this week make mandatory campaign stops at the annual Paris farm fair as polls show farmers increasingly tempted by the far-right's Marine Le Pen when they even bother to vote at all. Reuters UKConservative French presidential candidate Francois Fillon vowed to stay in the presidential race on Wednesday despite a magistrate's intention to place him under formal investigation for alleged misuse of public funds. Reuters UKEmmanuel Macron's spartan presidential campaign headquarters in western Paris is abuzz with rows of young recruits busy at their laptops. France's centre-right UDI party, which has about 30 MPs in the lower house of France's parliament, on Wednesday suspended its support for the presidential campaign of conservative Francois Fillon, the party president said. The move follows news earlier on Wednesday that Fillon, a member of conservative party The Republicans, was to be put under formal investigation in an affair involving alleged misuse of taxpayer's money. The UDI has been backing Fillon's campaign since his election as the candidate of the right and centre-right in November, even though its youth wing has defected to the camp of rival centrist Emmanuel Macron. Reuters UKFrench presidential frontrunner Emmanuel Macron said on Thursday he would ban lawmakers from employing family members and from carrying out consulting activities, seizing on his conservative rival's legal troubles to project a clean image. Reuters UKA planned demonstration in support of Francois Fillon will be an "important moment" in France's presidential race, a lawmaker backing the scandal-hit candidate said, and will go ahead on Sunday in defiance of the sitting president's wishes. Reuters UKPresidential candidate Emmanuel Macron on Thursday pledged to "transform" France with major overhauls of the post-war pension and welfare systems as he sought to silence critics who say his bid is thin on substance.